The tandoor oven was installed at R.V.Burgess Park in 2013 and first used regularly in 2014. Here is a short Youtube video showing naan bread being made at the park in September 2014. 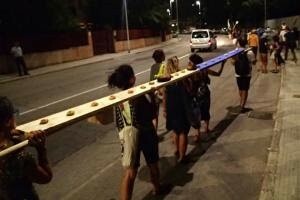 On August 28, 2016, a procession of people, music and bread moved from Lazaretto through the surrounding neighborhood, marina and across blockades along the waterfront. Bread was given away and passerby were invited back to the public square for a feast and more bread. 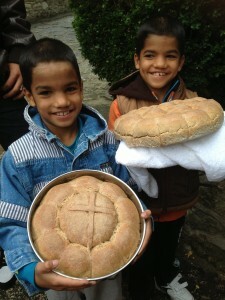 See what the “Making friendship bread” initiative is about and consider how you can start such an initiative here. Firing with love the ovens of the world! For us, bakeries and wood-fired ovens are the quintessential hubs of humanity, globally present and culturally diverse yet universally unifying. LOVEns is a free, global online platform uniting “Ovens without Borders”: both traditional oven builders and the heritage of their knowledge, as well as places with community ovens (in parks, traditional neighborhoods, etc. ), or bakeries with old wood-fired ovens around the world. 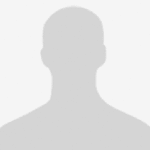 The LOVEns.net platform connects to our two other related global platforms: www.bakerswithoutborders.net and www.bakerieswithoutborders.net, the second specifically uniting bakeries social enterprises that employ and help people from disadvantaged groups. The inspiration for LOVEns and the Ovens without Borders was born during the travels and research of bread baking traditions around the globe of Dr. Nadezhda Savova-Grigorova, a cultural anthropologist from Princeton University (USA) and founder of the Bread Houses Network (www.breadhousesnetwork.org). 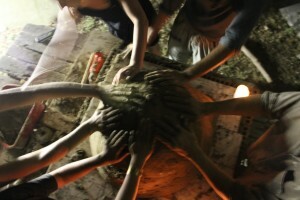 Our vision, mission and hope is to find, preserve, and promote various traditions of wood-fired ovens construction and baking from across cultures, and to help revive traditional ovens or construct new community ovens around the world and to build community around them, in particular in marginalized areas. 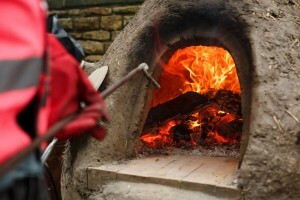 Historically, across Europe and the Middle East and North Africa, there were communal baking houses or just a communal wood-fired oven (furna/four/horno/forno/furnace; etc), and we hope to revive this tradition as an needed tool for social inclusion and cohesion in our ever more divided world. During her academic research of bread baking traditions around the globe, cultural anthropologist Dr. Nadezhda Savova-Grigorova, founder of the Bread Houses Network, discovered intriguing and inspiring stories about community ovens and bakeries, which often served as the main community gathering and meeting place, and were really the burning and beating hear of the community! This photo dates back to 1925 from the album of the Burzovi family. 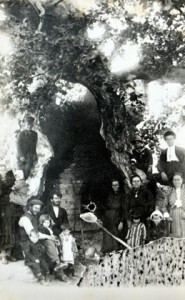 It shows a unique communal breadbaking oven, in the center of the village of Dzhigurovo (close to the town of Sandanski, Bulgaria), built into the base of a millennial plane tree! The communal bread bakery was closed in 1928 after the local people noticed that the tree started languishing. The tree still exists (and can be seen on the next photo); its circumference at its base is 57.4 feet. Hearing about our popular Harlem Bake events, a homeless shelter, part of a Russian Orthodox Church in the low-income Brighton Beach area of New York, got inspired to build their own oven. The priest, Father Vadim, imagined building a wood-fired oven on wheels in order to take it out to the streets where the homeless gather and to try to inspire them to bake with other locals and, hopefully, to help break their skepticism, touch their hearts to open up, and help them change their lives. But how to build the oven, and with no money on hand? An angel showed up: an immigrant from Ukraine who turned out to have built the ovens of one of the biggest monasteries there, Pochaev! He volunteered his labor, invented the design, and in just a few days in January the oven was ready, and, indeed, it proved to open up the hearts of the homeless. On a freezing January morning, 2012, one homeless Muslim man, in particular, had tears in his eyes when he shared how the fire in the warm hearth in the freezing cold reminded him of his far-away homeland and it gave him new hope to go on! Harlem, New York, is both world-famous for its jazz and notorious for its gang violence – a place certainly in need of bread breaking! 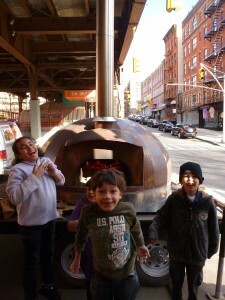 I asked around and a friend of mine, Elizabeth Ryan, a farmer and activist from Upstate New York, joined my cause and offered her 3-ton wood fired oven on wheels, which had been shipped brick by brick from France to the USA, to travel down to Harlem for Christmas, 2011, all at her expense! The Christmas journey to New York, starting around 5am on a freezing morning, was the first adventure, but parking the oven was an even greater one! But all of our efforts were worth it, since the joy in the neighborhood was overflowing and the people who joined – totally unexpected: teenage boys visibly members of local gangs and hip hop fans along with policemen and grandmothers and kids from various ethnic groups. A mother shared with me that, for her, that experience was truly transformative, because she had just come out of prison and did not know how to reconnect to her daughter, but making bread together seemed to be the perfect way to bond! Our Christmas celebration culminated with a song that praised the real dough even more so than the financial “dough” (slang for “money) – indeed, a “Harlem bake” better than a “Harlem shake”! The “Harlem Bake” events continued thanks to a local organization helping the homeless and the low-income families called Emmaus House, while the mobile oven is still used for community baking at Elizabeth’s farm in Upstate New York, and people come sometimes driving a few hours to enjoy the unique atmosphere of the oven in its natural setting of a century-old apple farm. 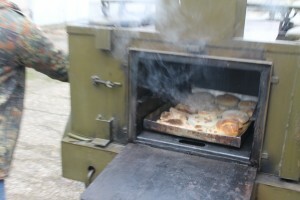 With the belief that wood-fired ovens can again serve as unique focal points of unity in neighborhoods around the world, Nadezhda first experimented by building a mobile wood-fired oven part of what she envisioned as a Mobile Bread House. 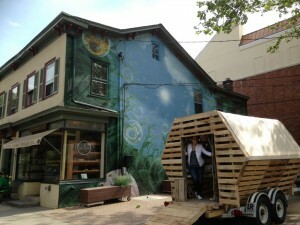 In 2012-2013, Nadezhda and a volunteer team of a designer from Pratt Institute, New York, and architects from Harvard University, with the financial support of Princeton University and the local Princeton artist Pete Abrams, created the Mobile Bread House (MBH). 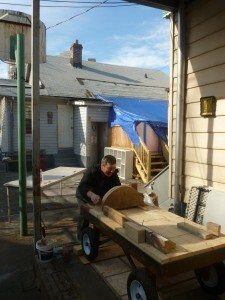 Built on a trailer out of recycled shipping palettes, the MBH houses also a special custom-made dirt press for creating dirt/mud bricks that could be used for building community ovens in different neighborhoods. 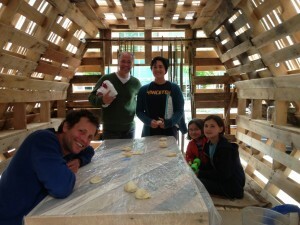 With one of the Princeton University Mobile Bread House’s construction team members, Sarah Kantrowitz, an architect from Harvard, the two were invited to present the Bread Houses project at the Venice Biennale of Arts, as part of the American Pavilion community arts projects. 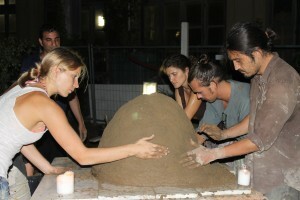 Nadezhda and Sarah Kantrowitz organized the construction of a wood-fired oven in a low-income neighborhood of Venice, on the island of Lido. It was built in the yard of an old, desolate and dilapidated hospital, which local creative and socially engaged young artists wanted to revive as a community center for all ages and ethnic groups, such as the many local immigrants from the Balkans, Ukraine, and Russia, taking care of elderly people in their homes. 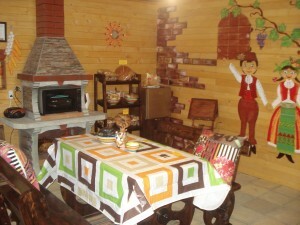 The school oven and the whole small wooden house built around it are used for two purposes: one is engage the children in regular weekly baking using the proven methods for Bread Therapy (www.breadtherapy.net) of the Bread Houses Network, developing various social, life and work skills; second, the Bread House serves as a space for social integration of these children, which are in such a vulnerable position often not only because of their various disabilities but also from the Roma ethnic minority, uniting them to bake with others from the local community around the wood-fired oven. 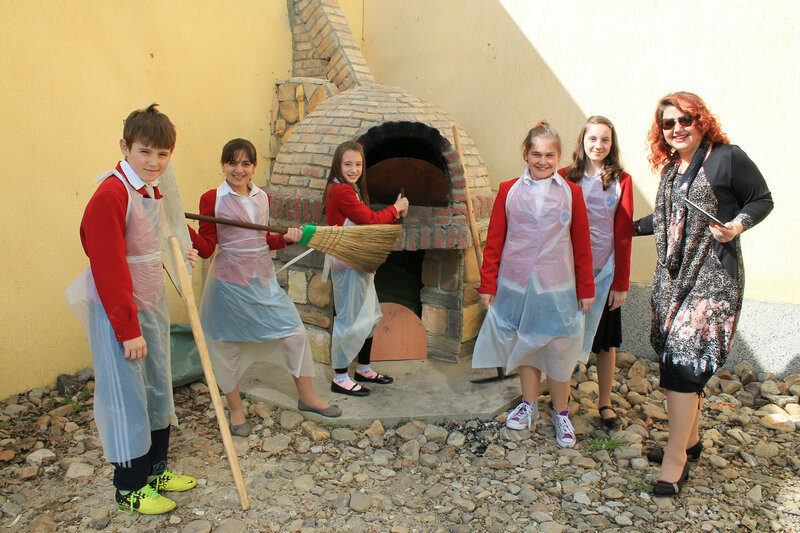 An enthusiastic high school principal in the town of Nova Zagora got inspired by the Bread Houses Network initiatives and decided to build an oven in her school’s yard. 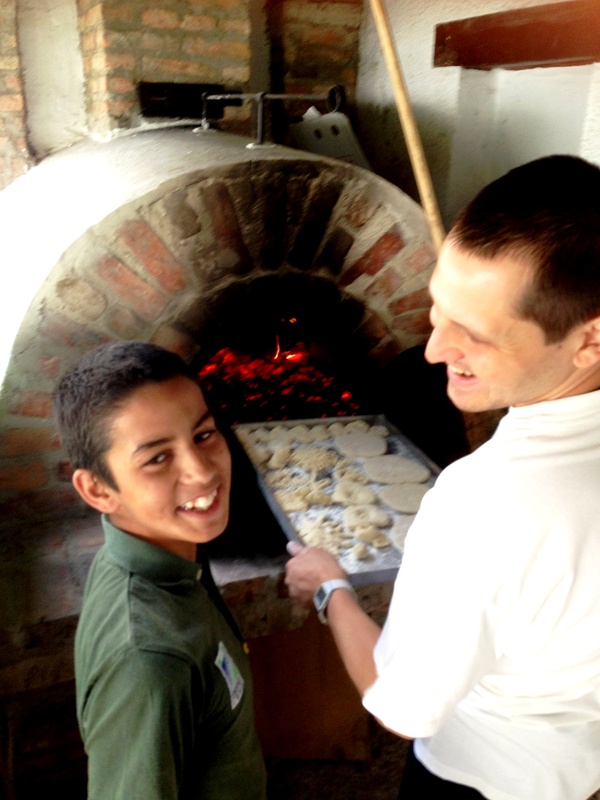 The school oven soon became a community oven, around which the high school students get together to make bread with people of various ages, with children from a local orphanage, and also baking with refugees from the local refugee camp in the village of Bania. Community baking with the refugees proved to be a wonderful method for social integration, as the diverse cultures share their traditions and become more easily accepted in the local community. 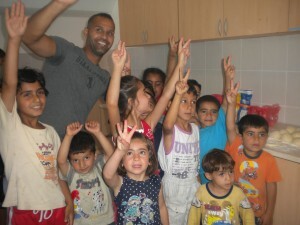 This experience gave birth to the Bread Houses Network program called “Ovens for Peace” particularly dedicated to building peace around bread making, explained in more details below. The wood-fired oven at the High School “King Simeon the Great” in the town of Vidin is planned to be built in 2016 and to be used to inspire the teenagers towards culinary and other creative careers using their hands, imagination, and creativity, and to be used as a tool for community building for the whole town. 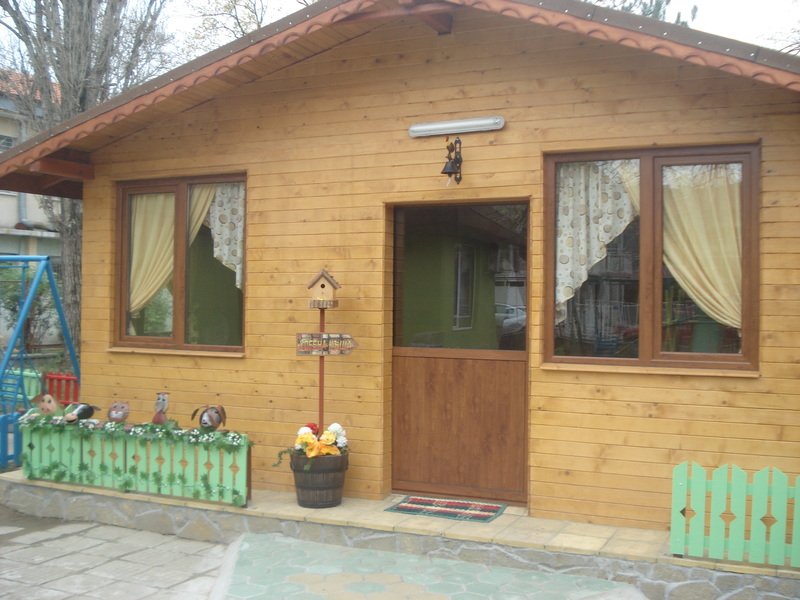 The Riviera Day Center for adults with mental disabilities in Varna have been trained and using the Bread Therapy methods of the Bread Houses Network since 2012. 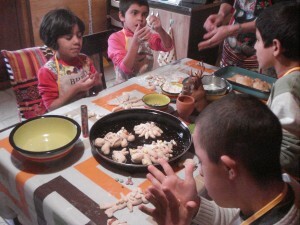 Inspired by the success of the methods with their patients with special needs, Riviera started inviting for larger community baking events other day centers and social institutions for mixed events, and managed to fundraise from a Dutch foundation to be able to build their own community oven in the yard of the center. The oven is expected to be built in 2016. The Archangel Michael Community Center and Orthodox church (www.arhangel.bg) in the city of Varna, on the Black Sea coast, got inspired by the community baking methods of the Bread Houses Network, and in 2010 built their own community oven in the yard of the church and community center. There, around the oven, people of all ages and various social institutions come together to bake and build friendships: elderly people from hospices, orphaned or abandoned children, low-income families, and homeless people – all are helped by the church community and help each other! 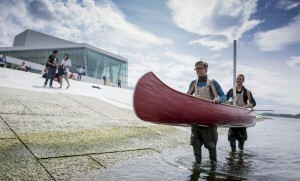 The public art project Flatbread Society in Norway is taking on a canoe a mobile oven along river and sea across Norway to unite people around making and baking bread! 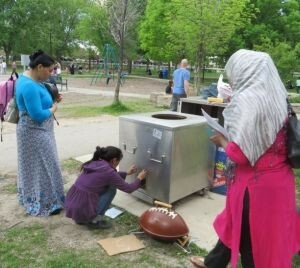 The tandoor oven installed at R.V.Burgess Park in Toronto. Find out more about this inspiring initiative here. In 2016 in Sheffield, England, Friends of Sheaf Valley Park put efforts to revive a great community tradition of community ovens and baking, and reinstate the Shrewsbury Road parish oven. It included hand making a traditional cob oven; organising a series of real bread making classes; and opening up the oven on a regular basis for community bread baking sessions. Find out more about this exciting project here. Elizabeth Ryan is a farmer in Upstate New York and an activist, who is one of the founders of the farmers markets in New York City and a passionate advocate for preserving organic farming. 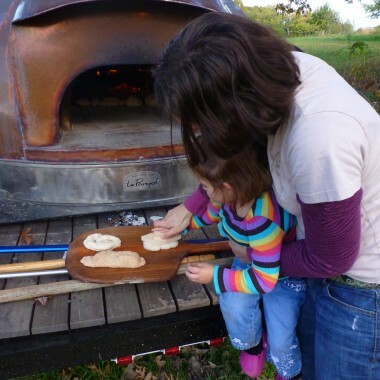 On her apple farm in Upstate New York, Elizabeth has put up for community use an amazing 3-ton wood-fired, cooper-covered oven on wheels. 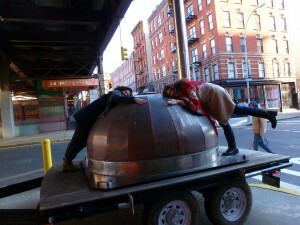 It was shipped brick by brick all the way from France to the USA, and for Christmas, 2011, it travelled all the way to Harlem, New York, all at Elizabeth’s expense, as she joined the cause of the Bread Houses Network to offer community baking events with the Theater of Crumbs and Kitchen Music methods. 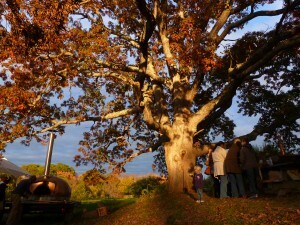 The mobile oven is still used for community baking at Elizabeth’s farm, especially for the few wonderful music-dance-and-food festivals she organizes annually, and people come sometimes driving a few hours to enjoy the unique atmosphere of the oven in its natural setting of a century-old apple farm. 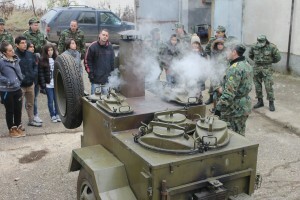 With the rising refugee crisis in Europe, the Ovens for Peace program is now evolving in Bulgaria with the mission to transform old military ovens (metal trailers moved and used for cooking and baking) and turn them into movable wood-fired ovens to be taken to refugee camps, Roma ghetto areas, and socially marginalized institutions such as orphanages, elderly people’s homes, etc. Have more questions? Want to learn more about our programs?Interested in being part of our family of Ovens Without Borders, and becoming a community “Loven”? Contact us!